When I first came to know about manner call I found it very interesting and productive app that helps user a lot. What is Manner Call and its purpose? 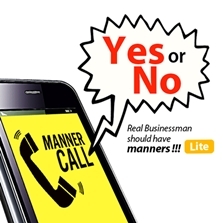 Manner Call is an App that has been developed for the iPhone. When you are in a situation where you due to some reasons are not able to answer the incoming call like (in a meeting, in public places or you just don’t want to pick up specific person call) then manner call is a perfect app for you. In these situations you don’t have to ignore the person calling, just send a message or SNS by using manner call. Person get angry when you are not picking up the phone , so treat them in a good way using manner call.